Each decade since 1979, the U.S. Department of Health and Human Services (HHS) has published a comprehensive set of national public health objectives. Known as Healthy People, this initiative is based on the premise that setting objectives and monitoring progress can motivate action. The most recent iteration, Healthy People 2010, consists of 467 objectives, organized into 28 focus areas. It has two overarching goals: (1) to increase the quality and years of healthy life, and (2) to eliminate health disparities. In 2005, the Office of Disease Prevention and Health Promotion (ODPHP) and ASPE determined a need to investigate the awareness and use of Healthy People among the initiative’s target audiences. ODPHP and ASPE contracted with the National Opinion Research Center (NORC) to conduct an assessment of how the Healthy People 2010 initiative was being used by state, local and tribal health organizations/agencies. 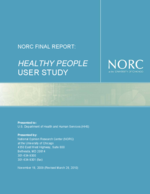 NORC’s Assessment of the Uses and Users of HealthierUS and Healthy People 2010 (hereafter referred to as the “2005 User Assessment”) identified important differences among states, localities, tribes, and organizations/agencies of various sizes in terms of their exposure to and use of the initiatives, as well as the extent to which they found them relevant and effective. Since the 2005 User Assessment, HHS has undertaken a number of efforts to increase awareness of the Healthy People initiative among certain stakeholder groups. For example, ODPHP worked with Regional Health Directors and State Healthy People Coordinators to conduct targeted outreach to tribes and local health organizations/agencies to increase their knowledge and use of the initiative. Other HHS and non-federal partners have also disseminated program and implementation tools such as Healthy Youth (Centers for Disease Control and Prevention, 2004), Rural Healthy People 2010 (Gamm & Hutchinson, 2004), and models for state-based Healthy People initiatives (State Healthy People Plans, 2008). To assess the cumulative impact of these efforts and the current level of awareness and uses of Healthy People 2010, a follow-up study—the 2008 User Study—was conducted.